U.S. Right to Know—a new nonprofit organization — recently released a new report on Big Food’s PR campaign to defend GMOs: how it manipulated the media, public opinion and politics with sleazy tactics, bought science, and PR spin. Since 2012, the agrichemical and food industries have mounted a complex, multifaceted public relations, advertising, lobbying and political campaign in the United States, costing more than $100 million, to defend genetically engineered food and crops and the pesticides that accompany them. The purpose of this campaign is to deceive the public, to deflect efforts to enact GMO labeling that is already required in 64 countries, and ultimately, to extend their profit stream for as long as possible. 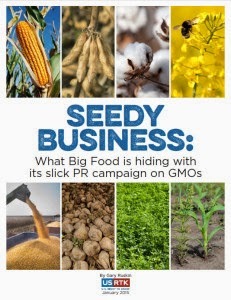 The report, titled Seedy Business: What Big Food is Hiding with Its Slick PR Campaign on GMOs, outlines fifteen things that Big Food is hiding with its artful PR campaign on GMOs. The FDA does not test whether GMOs are safe. It merely reviews information submitted by the agrichemical companies. The agrichemical companies have a history of concealing health risks from the public. Companies that produce GMOs have hidden the truth about the dangers of their products from consumers and workers. So how can we trust them to tell us the truth about their GMOs? What the agrichemical and tobacco industries have in common: PR firms, operatives, tactics. The agrichemical industry’s recent PR campaign is similar in some ways to the most infamous industry PR campaign ever—the tobacco industry’s effort to evade responsibility for the deaths of hundreds of thousands of Americans each year. The agrichemical companies have employed repugnant PR tactics. These tactics include attacks on scientists and journalists, and brainwashing children. Monsanto supported GMO labeling in the UK but opposes it in the USA. Although Monsanto is based in St. Louis, Missouri, Monsanto believes that British citizens deserve stronger consumer rights than Americans do. The pesticide treadmill breeds profits, so it will likely intensify. It is in the financial interest of the agrichemical companies to promote the evolution and spread of superweeds and superpests, because these will spur the sale of pesticides. GMO science is for sale. Science can be swayed, bought, or biased by the agrichemical industry in many ways, such as suppressing adverse findings, harming the careers of scientists who produce such findings, controlling the funding that shapes what research is conducted, the lack of independent US-based testing of health and environmental risks of GMOs, and tainting scientific reviews of GMOs by conflicts of interest. The full report is available at www.usrtk.org/gmo/seedy-business/.